Now that's what we call a blood motif. BioWare's Spiritual Successor to the legendary Baldur's Gate franchise, Dragon Age is a Dark Fantasy video game series set in the world of Thedas (originally an acronym for 'The DA Setting'), a Deconstruction of the Standard Fantasy Setting, drawing inspiration from sources as diverse as The Wheel of Time, A Song of Ice and Fire, and Buffy the Vampire Slayer and filled to the brim with Fantasy Counterpart Cultures and Black and Grey Morality. 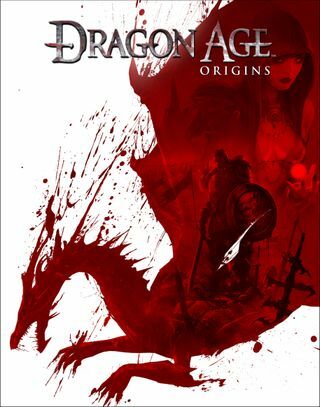 The first game in the series, Dragon Age: Origins, was released in 2009, to a great deal of critical and commercial success. Its sequel, Dragon Age II, was released in 2011 on March 8th in North America and on the 11th in Europe. Dragon Age: Inquisition is currently in development, and is set to release on October 7, 2014. In addition to the games, the series contains five novels. The first two are prequel, describing events leading up to the start of Origins. The next two are sequels, taking place shortly after Act III of Dragon Age II. The fifth delves into the history of the Grey Wardens and their association with griffons, and is expected to tie into Inquisition. Their are also several comics in the franchise, as well as a P&P RPG developed by Green Ronin Games. A direct-to-DVD anime adaptation has also been release, to mixed reactions. Also released is a Webseries, Dragon Age Redemption, produced by and starring Felicia Day, who is a fan of the franchise. Cheap Gold Coins: Almost averted, where one gold coin equals 100 silver coins or 10,000 copper coins. IRL, the respective metals' prices ratio is about 427:8:1. However, a standard dagger costs 8 silvers in Origins and 5s 24c in II, which is about five bucks by the same calculation as used in the D&D example above. The Blacksmith: Gleam and her adoptive father. Healing Hands: Gleam, to an absurd degree. Without any real training to boot. New Powers as the Plot Demands: In issue 4, templars are capable of stopping enemy mages from casting magic. But apparently not in issue 1. Oh, they are.. The absence of it in issue 1 was simply an oversight or the Rule of Drama. Playing with Fire: Veness, Gleam. Power Nullifier: The new templar power in issue 4. Actually, they use it in the game, too. Ultimate Blacksmith: Issue #2 starts with Gleam using her magic to help her forge a sword. The result is a sword which cuts through pretty much anything. This page was last edited on 11 March 2018, at 03:35.